- Email for YOUR cost (or ADD to cart for YOUR price)! NEW LOWER PRICING - Email us NOW for YOUR price on the Melody H2! OR "ADD to Shopping Cart to see our price NOW! The NEW Jupiter/AlkaViva Melody II water ionizer NOW has 5 solid ionizer plates and makes even MORE hydrogen for you! With its unique dual filtration it also now comes with a lifetime warranty! 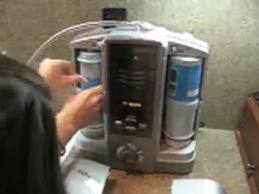 This beautiful state-of-the-art water ionizer comes with superb filtration capabilities! AND, another reason to love the NEW Melody II, we have CLEANING filters available for your annual deep cleaning! No garden pump, vinegar or citric acid needed! Simply pop in the cleaning filter and restore your Melody II to like-new condition! WE WILL BEAT ANY COMPETITOR'S ADVERTISED PRICING! Just send us their link! PLUS you get our FREE GOODIES and our customer service!! Just call us NOW at 561-291-9780! GREAT 5 plate ionizer with increased ORP (negative charge) - this is the NEW, IMPROVED Melody II (formerly Jupiter Melody) with EXTRA Hydrogen and negative ORP. This ionizer is the "sweet spot" for production, quality and price! DARC Dual Automatic Cleaning System - eliminates mineral buildup during ionization - everytime it runs! 13-Stage Duo Filtration System - BEST on the market for pristine water! Payment Plans: YES - FREE PAYMENT PLANS - NO FEES - NO INTEREST - NO CREDIT CHECK - Call us! YOUR NEW MELODY II COMES WITH over $80 in FREE GOODIES! FREE GOODIES includes 2 of our Portable Hydrogen Water Ionizer Sticks for traveling! pH Test Kit to test water at home and another one for on the go! At your sink plumbed directly to your cold water line. There is no diverter used and you can operate the AthenaH2 while running the hot water out of your tap faucet. Undersink, in the cabinet, completely out of sight with a small dedicated faucet (optional undersink kit required). 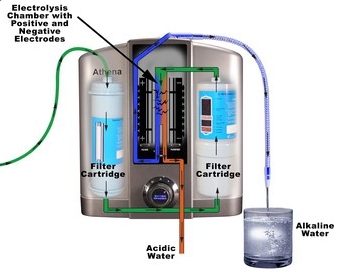 New extended lifetime warranty on the Athena water ionizer begins on the purchase date. The Lifetime Warranty covers the original purchaser for life on all parts (bumper to bumper) and 100% of labor costs in the first five (5) years. After the first five (5) years, the purchaser is responsible for any labor costs (billed at $60/hr.) to a maximum of $199 per occurrence. Average repair time is less than one hour. Jupiter/AlkaViva will cover all shipping costs for 1 year, and then return shipping for up to 5 years from date of purchase. After that the purchaser is responsible for all shipping. Items that have not been assigned an RMA number will not be accepted. *This warranty only covers failures due to defects in materials and workmanship which occur during normal use. 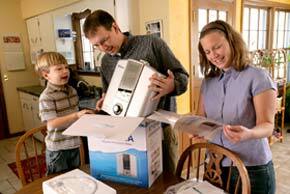 This warranty does not cover damage which occurs in return shipment, or failures which are caused by products not supplied by the warrantor, or failures which result from accident, misuse, abuse, neglect, mishandling, faulty installation, misapplication, improper insertion of consumables, set-up adjustments, maladjustment of consumer controls, improper operation or maintenance, alteration, modification, power line surge, improper voltage supply, commercial use, or service by anyone other than an authorized repair facility, or damage attributable to acts of God. There are no expressed warranties except as listed above. The warrantor is not responsible for incidental or consequential damage; for damages arising out of the use of any unauthorized attachment; or for damages resulting from the use of the product with a defective water faucet and/or water that is judged by the local authorities as "hard" (TDS above 18 grains). All expressed and implied warranties, including the warranties of merchantability and fitness for particular purpose, are limited to the applicable warranty period. Repair and/or replacement will be at the final discretion of the manufacturer. ** NOTE THIS PERTAINS TO ALL POTENTIAL IONIZER USAGE: If well water, distilled water, softened water or reverse osmosis water is being used, certain steps must be taken to successfully use a water ionizer. Well water may require a pre-filter system and may not produce expected pH or ORP, due to the mineral, pH and ORP levels in the source water, but this can be corrected. Distilled and/or reverse osmosis (RO) will need to be remineralized, and we do carry filters for this purpose. Both distilled and RO are acidic waters and leach alkaline minerals from your body and bones. In addition, reverse osmosis machines waste about 5 gallons of water for every 1 gallon produced! Softened water cannot be used through a water ionizer due to the high sodium content, which causes the ionizer to overheat. This information is universal for ALL water ionizers on the market. Additionally, pH and ORP results vary based on incoming source water and results are not guaranteed for this reason. Source water variables include pH, ORP, TDS, mineral content and temperature. These variables are applicable both to well water and municipal water sources.